C.K. was incredibly open about his plans. Once the show was put online, he talked about it plenty, speaking on Reddit’s Q & A session, and answering questions in-depth. The media jumped on it, but that’s not the story. The important thing is how buyers reacted and whether this model is viable. The massive rise in torrenting is a sign that current price structures and release formats aren’t tolerated by the consumer. Budgets are too high, actors are overpaid, and costs are over-inflated. Six huge international corporations own the majority of entertainment and decide how much we pay, colluding to maintain the status quo. It’s why there are three versions of a BluRay release—two editions, each with their own unique special features, and then the final, ultimate edition, with both sets of features combined. It’s why Australians can’t watch Hulu. It’s why DRM ruins discs. It’s why people who merely link to content are chased by lawyers. That’s the theory, and the theoretical answer is a more democratised structure for our entertainment distribution. If we reduce costs, restructuring the business towards a cheaper end-price, people will start buying things again. Louis C.K. listened to this discussion and gave it a shot. He joins the ranks of a sparse few: Trent Reznor, Radiohead (kind of), The Tunnel. 12 hours later, we had over 50,000 purchases and had earned $250,000, breaking even on the cost of production and website. As of today, we’ve sold over 110,000 copies for a total of over $500,000. Minus some money for PayPal charges etc, I have a profit around $200,000 (after taxes $75.58). This is less than I would have been paid by a large company to simply perform the show and let them sell it to you, but they would have charged you about $20 for the video. They would have given you an encrypted and regionally restricted video of limited value, and they would have owned your private information for their own use. They would have withheld international availability indefinitely. This way, you only paid $5, you can use the video any way you want, and you can watch it in Dublin, whatever the city is in Belgium, or Dubai. I got paid nice, and I still own the video (as do you). You never have to join anything, and you never have to hear from us again. So it’s been about 12 days since the thing started and yesterday we hit the crazy number. One million dollars. That’s a lot of money. Really too much money. For C.K., the experiment worked, but it’s important to point out that he has an international reputation and a lot of fans. What does this mean for the little guy? Will we see a sea of Ma and Pa DIY business structures springing up around young and old musicians, comedians, films and artists? Or is this one of those freak moments that seems wonderful but is, in the end, the historical outlier? It’s hard to know, but it does appear that this structure is scalable. It’s designed for small operations to succeed. By virtue of how relatively small the pay-off is, the team must remain small in terms of manpower. With crowdsourcing and profit share schemes being utilised as complementary tools, there’s no reason why a band or artist or theatre group can’t do what Louis C.K. did. They just need to do much more work in promoting themselves and expect a lower return (which means keeping a tight rein on expenses to increase the chances of break-even or profit). It’s risky, but not much riskier than the status quo—and with a much more equitable arrangement. Fact is, not a lot of bands do well under a contract from the Big Six; the industry is riddled with stories of bands who sound like the flavour of the month, are bought up in bulk and never released so that labels can minimise or control the competition to their pet band or recording artist. Putting your album up online via a cheap template site is surely more enticing than being locked in a dead-end contract for ten years. A hurdle for a lot of young artists is their lack of organisation. Producers and managers (and to some degree, execs) exist because they can balance a budget, arrange broad scale, multi-site projects, and understand the details of a contract. Artists don’t really learn those skills at art college, on the road, on set, or treading the boards. It can be tough negotiating with or against a big studio or label, but at least that big studio or label can take care of large scale problems and achieve a far greater market penetration. Doing all that yourself, while writing a new song, stand-up set, or script can seem impossible. That doesn’t mean that C.K. and co’s new structures can’t be utilised by an artist who lacks high-end business skills. Those with talent can, for example, hook up with young, hungry, savvy managers and producers who ‘get’ the internet. The pay will be slight at the outset, but success will mean everyone involved gets richer, not just the studio or label or network that owns it all. It’s exciting to think of a producer with a cadre of talented artists under his wing, all releasing content directly to their fans—no middle man, no shifty corporate stooging of buyers. I foresee TechDirt or Wired running hotly debated articles about start-up ‘pirate producers’ jumping ship when their talent gets hot and joining Sony or Warner, while other ‘pirate producers’ stay true to the new structure and reap the rewards for themselves and their artists. It’s a time much like the 1970s in the world of film, when directors left the studios and shot their movies in the big wide world, independent. So it seems that change may finally be coming in the business of arts and entertainment, and with it, more freedom for artists and consumers. It’s important that we learn as much as we can from pioneers like Louis C.K., so that we can apply these lessons to the new crop of talent and their support teams. If we truly want to break the hold of six multinationals, we’ve got a lot of work to do. Guys like C.K. give us a banner under which to unite. The future’s opening up online, and it only took two decades. May we make the most of it. 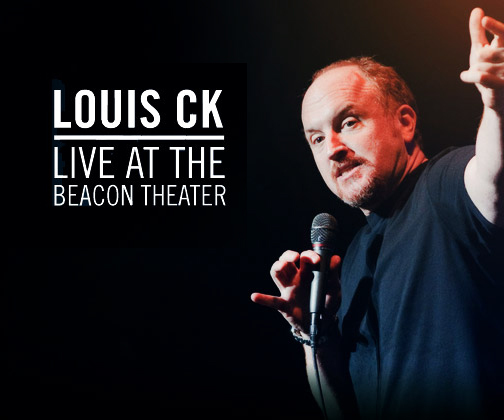 TAGS: analysis, Beacon, C.K., CK, entertainment, future, In Rainbows, Live, Live at the Beacon Theater, Louis, Louis C.K., Louis CK, NIN, online, pirating, Radiohead, Reznor, Simon J. Green, Theater, torrent, Trent, Trent Reznor, what does it mean? As someone who purchased a download of this show and then gifted another to a friend, I can say at least part of the reason I did so was to support what I see as a positive direction in the way entertainment is consumed and to join up with what feels like the future. It also helps that the show is deeply hilarious. His bits on playing Monopoly with his kids or encountering soldiers on airplanes are some of the funniest out there right now. The fresh content and the fresh delivery system reinforce one another. thanks for posting this, simon. incredibly informative. Nat: Gifting! Great idea. I was thinking about how I could lend the episode to a friend and then encourage him to buy it if he liked it, but gifting is way better. That’s the only problem with the modern digital version. You lend it to a friend, it’s the same as pirating. Ah well, I hope people like you guys and me, who all bought, gifted and encouraged others to buy keep these sorts of ventures afloat. There really is a community of goodwill towards those who want to make the digital media landscape better this way. reading this makes me hope you read the lefsetz letter. this is all he’s been able to talk about lately. and for the 6 months (at least) before that, he would only talk about how artists can’t go out expecting the big pay-out immediately if they want to ride it as a career rather than a lark. his big thing is the 10,000 hours, don’t expect to make more than $30K/year for the first 5 years (if your lucky), but if you can pull through that and you’ve still got something people want, they’re going to want it in this louis ck kind of way. this experiment gives me hope.